Beverly Tsacoyianis was inducted into the Edward A. Bouchet Graduate Honor Society at the annual Bouchet Conference on Diversity and Graduate Education at Yale. The Bouchet Society, named for the first African-American to earn a doctorate in the United States, recognizes outstanding scholarly achievement, and promotes diversity and excellence in doctoral education and the professoriate. Beverly is due to earn her doctorate in history from Washington University in St. Louis in August after completing her dissertation, “Making Healthy Minds and Bodies in Syria, 1903-61,” and will start a tenure-track position in Middle Eastern history at the University of Memphis. She has received numerous honors, including a Fulbright-Hays Doctoral Dissertation Research Abroad fellowship and a P.E.O. Scholar Award. She is also the book-review editor for the Syrian Studies Association. Ted Silverman married Elena Roht on Nov. 17, 2012, at Indian Pond Country Club in Kingston, Mass. Ted, who earned an MBA from New York University’s Stern School of Business in 2008, is vice president of BFE, a commercial and residential real-estate investment firm in New York. Dmitri Krasik writes, “Moved to NYC (long-standing dream), and am enjoying life in the West Village. Now, where are my old Brandeis pals?” After eight exciting years as an event planner in Boston and New York, Sheralyn Caballero made the bold leap in 2012 to pursue her true passion, interior design. She now works at HomePolish, a burgeoning interior-design firm in New York City. She resides in Hoboken, N.J., with her husband of seven years, Eric Caballero, and her 8-month-old papillon, Rocky. Sheralyn and Eric are expecting their first child, a boy, this summer. Daniel Fink has lived in Tel Aviv for the past two years after graduating from the Johns Hopkins School of Advanced International Studies. He works as a commodities analyst at GHF Group, an Israel-based financial firm. He sends a shout-out to his sister Miriam ’16. Jesse Gordon finished her family-medicine residency at Chicago’s MacNeal Hospital in July 2012. She and her fiance, Winfred Frazier, who is also a family physician, are doing short temporary assignments and exploring the country. They spent the fall in Tacoma, Wash., and are now in Maui, where they plan to stay until their wedding in October. Brent Jones and Sarah Graham Jones welcomed baby June Margery on Jan. 9. Cameron Gordon acted in a short film (buskfilms.com/films/do-you-have-a-cat-2), produced a short (www.funnyordie.com/videos/00ef131f37/guess-whom) and appeared in the feature film “Battledogs” on the Syfy channel. Donoghue Barrett & Singal litigation attorney Callan Stein was named one of Massachusetts Lawyers Weekly’s 2013 Up and Coming Lawyers. He was recognized for his work in the civil and the white-collar criminal litigation arenas. Callan was involved in two significant victories for his clients recently, winning dismissal of a high-profile civil suit brought against a former Massachusetts probation department employee and helping win a landmark federal-court ruling in a scientific misconduct case. Becky Rowlands and her husband, Peter Sylvain, had a son, Thomas (Toby) Howard Sylvain, on Feb. 23. Becky writes that he has lots of blond hair. Rabbi Rachel Silverman and Josh Bob ’01 were married on Oct. 28, 2012, at Congregation Mishkan Tefila in Chestnut Hill, Mass. The wedding was officiated by Rabbi Allan Lehmann (former Brandeis Hillel chaplain) and Jacob Cytryn. Also in attendance were Elana Fein; Emily Fishman ’09; Alison Beker Judd; Isaac Judd; Avi Killip ’07, MA’08; Meg Berenson Lederman ’03, MAT’05; Jen Nadler Segal ’03; Josh Segal ’03, MA’04; Michelle Shain; Adam Shain, MS’04; Lauren Gottschalk Stefano; Andy Stefano; and band leader Behzad Dayanim, MA/Heller MBA’06. Geryl (Rich) Baer and Louis Baer had a baby boy, Lyle Emmett, on Jan. 31. Parents and baby are doing great. Lyle has already met lots of Brandeis friends. Isabel de Koninck is the director and campus rabbi of Hillel at Drexel University, where she oversees programming for about 900 Jewish students. She received her rabbinical ordination and earned a graduate certificate in Jewish gender and women’s studies from the Reconstructionist Rabbinical College in 2010. 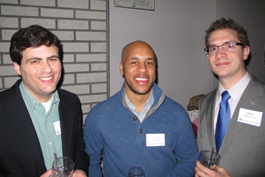 TRAFFIC STOP: Jonathan Senker ’04, Diony Elias ’04 and Mark Brescia ’04 were among the 45 members of the Alumni Club of New York City’s Lawyers and Real Estate networks who met for a happy hour at Traffic Bar in Midtown. Rebecca Olshan ’76 and Joseph Spraragen ’92 chaired the event. 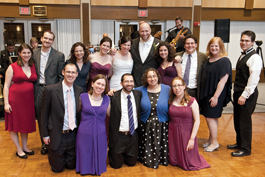 MAZEL TOV: Rabbi Rachel Silverman ’04 and Josh Bob ’01 were surrounded by Brandeis friends at their wedding. Front row, from left: Isaac Judd ’04; Michelle Shain ’04, MS’04; Adam Shain ’04; Emily Fishman ’09; and Elana Fein ’04. Back row: Lauren Stefano ’04; Andy Stefano ’04; Alison Beker Judd ’04; Meg Berenson Lederman ’03, MAT’05; Rachel; Josh; Avi Killip ’07, MA’08; Josh Segal ’03, MA’04; Jen Nadler Segal ’03; and Behzad Dayanim, MA/Heller MBA’06.